The King introduces new horror voices. 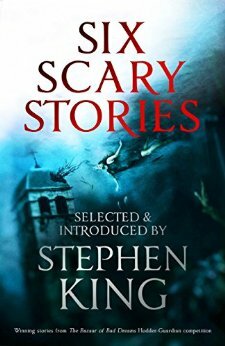 When Stephen King released his last collection, The Bazaar of Bad Dreams, Hodder ran a short story competition that would be judged by the author himself. As he says in his introduction, there was no way he could read all of the entries, there were just too many – but a judging panel that included his Hodder editor, Philippa Pride, sifted through the entries and decided on the top six stories. These were then sent to Mr. King, who chose the eventual winner, Elodie Harper – whose story was entitled ‘Wild Swimming’. That wasn’t the end of the matter, though. At King’s suggestion, Hodder decided to release the six finalists’ stories in an ebook, with an introduction by the writer. And this is the resulting ebook. The stories themselves cover a wide range of material, as you would expect from six very different authors – and the writing styles themselves also vary, some showing more experience than others. But all share the ability to surprise you, all have something in their telling that makes you take notice – showing why these six authors made it to the final of the competition. The first story, Wild Swimming by Elodie Harper, tells the story of a woman staying alone in a guest house in Lithuania, eager to swim in the reservoir there – home to a buried village. She’s warned against disturbing the peace, but carries on anyway, and something is woken. The story works well, told in the form of emails sent by the protagonist to her friend in a gradual reveal of what’s going on, and Harper shows an engaging voice. The second story, Eau-de-Eric by Manuela Saragosa, tells of a child’s fascination with a teddy that has a smell redolent of the mother’s ex-partner. Saragosa paints a convincing picture of the mother’s realisation that something dangerous is happening, and the daughter’s anger at her mother’s treatment of the toy. The third, The Spots by Paul Bassett Davies, revolves around a man who is given a futile task by his ruler – and the consequences should he fail. A short, tight tale that works well. The fourth, The Unpicking by Michael Button, is a deeply disturbing story of what toys get up to when we’re not watching. The fifth, La Mort de ‘L’Amant by Stuart Johnstone, was written by the author as an attempt to show that clichés don’t always need to be avoided. It’s an entertaining tale of a cop talking to someone he suspects is a suicide waiting to happen – where nothing is quite as it appears. The final story, The Bear Trap by Neil Hudson, is a post-apocalyptic tale of a man surviving with difficulty and his unusual method of defence against intruders.